Form that says "2016 - Annual Records Solicitation Form. Shareholders, Directors and Officers"
A familiar problem is popping up again across the Volunteer State. 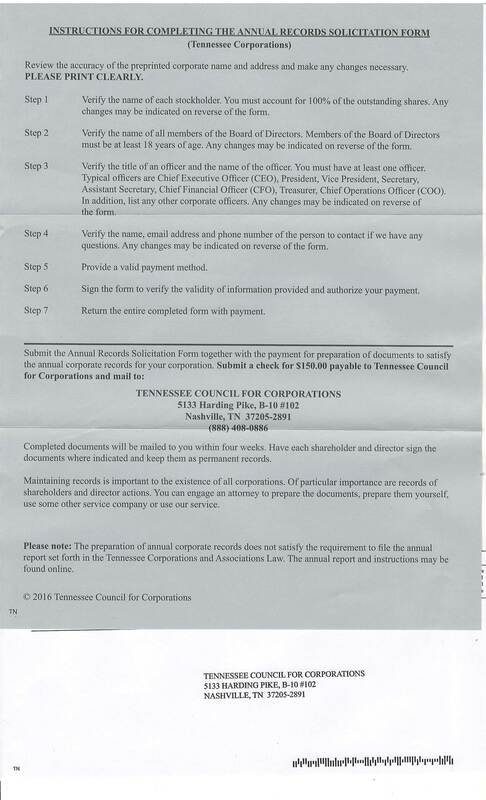 Many businesses are reporting receiving a solicitation letter from an entity calling itself the Tennessee Council for Corporations, a private, out of state company that offers—for a fee—to file business documents on an entity's behalf with the Tennessee Secretary of State’s Division of Business Services. 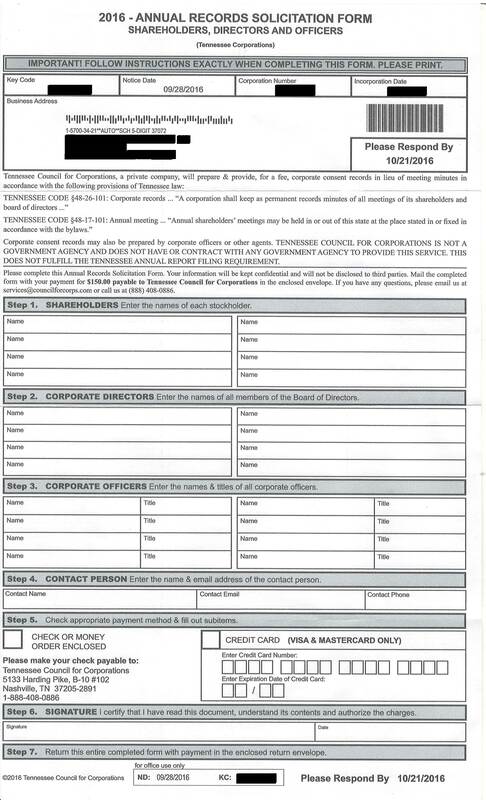 This solicitation, which was titled “2016 – Annual Records Solicitation Form” and mailed out to businesses in late September, offers to file annual reports for companies in exchange for a $150 fee. However, the standard fee for filing a corporation's annual report directly with the Division of Business Services is only $20, with an additional $20 fee charged if the Registered Agent or Registered Agent address is changed. 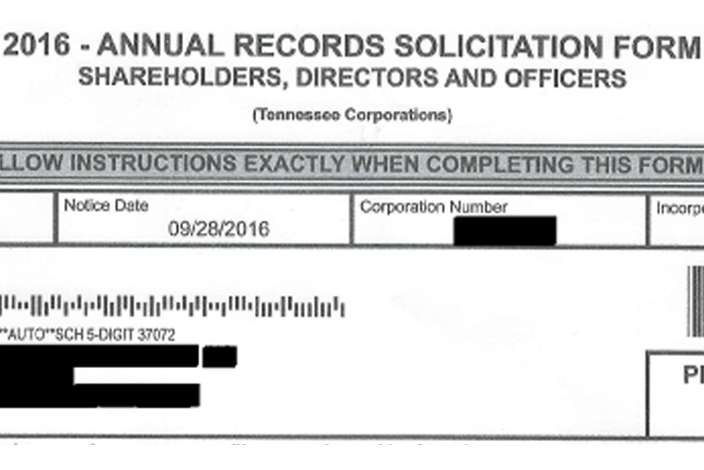 Tennessee Council for Corporations is not registered to do business in the state of Tennessee and is not affiliated or associated with the Division of Business Services. Their solicitation looks official and can easily be confused as being from the Tennessee Secretary of State’s Office. "It's important that our customers pay very close attention to anything they receive by mail and contact the Division of Business Services if they question anything," said Tennessee Secretary of State Tre Hargett. "These companies count on the fact that everyone doesn’t read the fine print." Secretary Hargett has been warning consumers about government impostor schemes for years and is featured in a July 2015 video highlighting the problem. Other companies that have generated government impostor complaints in Tennessee, but are not affiliated with the government include State Compliance Center, Tennessee State Compliance, Corporate Records Services, Division of Corporate Services and Annual Business Services. These companies have also mailed official-looking solicitation forms to businesses, claiming that they must pay filing rates far higher than what the state actually charges. IMPORTANT NOTICE: The documents offered by this advertisement are available to Tennessee consumers free of charge or for a lesser price from (insert name, telephone number, and mailing address of the applicable governmental entity}. You are NOT required to purchase anything from this company and the company is NOT affiliated, endorsed, or approved by any governmental entity. The item offered in this advertisement has NOT been approved or endorsed by any governmental agency, and this offer is NOT being made by an agency of the government. Penalties for violating this act include a fine of $100 for each letter sent and received by an individual and reimbursement of the state’s investigation and prosecution costs. Any fines collected by the Attorney General's office will be used in other consumer protection programs. Anyone who receives a suspicious solicitation purporting to be from the government should file a complaint with the Tennessee Division of Consumer Affairs (DCA).